Found 8 file extension associations related to Adobe AIR and 8 file formats developed specifically for use with Adobe AIR. Adobe AIR is a cross-operating system runtime that enables you to use your existing HTML/Ajax, Flex, or Flash web development skills and tools to build and deploy rich Internet applications to the desktop. Adobe AIR applications support native desktop integration, including clipboard and drag-and-drop support, local file IO, system notification, and more. Adobe AIR offers an exciting new way to engage customers with innovative, branded desktop applications, without requiring changes to existing technology, people, or processes. 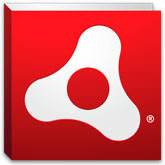 Adobe AIR is intended for everyone - from shopping on eBay to managing music, Adobe AIR means applications that are easier, more powerful, and more fun to use. Run AIR apps - Install and work with apps on Adobe AIR platform. If you need more information please contact the developers of Adobe AIR (Adobe Systems Incorporated), or check out their product website.